… liquid, potentized plant preparations which convey a distinct imprint, or etheric pattern of a specific flower. Originally developed by Dr.Edward Bach, flower essences enjoy a reputation of being highly beneficial and safe to use. Because they contain only minute traces of a physical substance, flower essences are not classified as biochemical medicine. 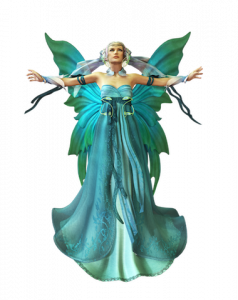 They belong to a new modality of potentized remedies which derive their active powers from life forces within substances. Flower Essences expand our understanding of health care, recognizing a relationship between body and soul, and intertwining spiritual, mental, emotional, and physical wellness. They address the subtle but vital realm of the human psyche, where thoughts and feelings emanate. Just as food sustains the human body, flowers nourish the human soul, enhancing emotional and psychological well-being. 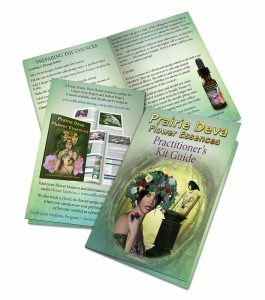 Prairie Deva Essences and Mushroom Essences are local to Canada. What Should I do if I’m alcohol sensitive? 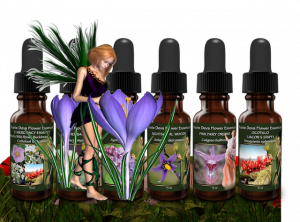 (Responses from the FES, Flower Essence Society) – Flower essences have been used successfully by many persons who are alcohol sensitive or in recovery from alcoholism. By adding two drops of each essence to a glass of water, there will only be a negligible amount of alcohol in the water (less than one-hundredth of one percent). You can also mix up a dosage bottle using cider vinegar or vegetable glycerin as a preservative, rather than brandy. The flower essences are also very beneficial when applied topically from the stock bottle in a variety of non-oral ways, including misting around the body, direct application to pulse points or energy centers on the body, mixed in creams, or added to baths. Of course, use your own judgment with your sensitivity. If this does not feel like a good option, try another therapy. Do flower essences have physical effects? Can they cure physical illness? (F.E.S-source)Flower essences do not work bio-chemically as aspirin does for a headache, but they can affect our experience of our bodies. For example, essences which help release emotional stress may result in less physical tension. Someone who overworks may discover just how tired he or she is. 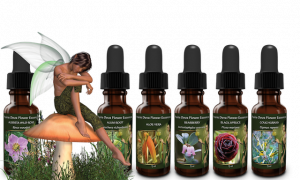 Flower essences can help people who suffer from physical illness by addressing the emotional responses to the illness, and by working with the underlying conflicts and tensions that may have contributed to the onset of the illness. However, flower essences are not cures for any specific illness and are chosen based on mental and emotional issues, rather than specific physical ailments. 3. How will I know if they are working? F.E.S. Unlike chemical drugs which suppress symptoms, flower essences are catalysts for emotional change and work by stimulating awareness. Many people report general but discernible differences with essences. They may feel clearer, calmer, or better able to cope. However, to note particular changes with flower essences, you will need some way of objectively observing your emotional and mental states. You may wish to keep a journal, discuss your issues regularly with a friend or counsellor, or take note of your dreams and other inner events. Often it is the comments of others close to us which first alerts us to changes taking place. Becoming aware of inner changes may take some practice. With physical experiences, we know how to focus our awareness on a problem or pain. For example, the pain is not just in my leg, but mostly in my foot, or precisely in my left foot; it’s a throbbing pain that is worse at night or in cold weather. Similarly, we can learn to be more precisely aware of our emotions and thoughts by a conscious program of self-observation and reflection. 4. How do I use flower or mushroom essences? They are typically taken orally from a dropper bottle; the standard dosage is four drops four times daily. You can take the drops directly from stock bottles available in stores; mix them in a glass of water, or make a dosage bottle by mixing several drops with water and brandy (typically ¼ to a ½ ounce) in a one-ounce dropper bottle. When mixing in a dosage bottle or glass of water, take two drops from each essence selected. There are many other ways of using them, such as in misting sprayers, in a cream base, or baths. Mushroom essences focus more on soul or shadow issues. They should smell beautiful, like the botanical name on the bottle suggests. It is a little disappointing for people who mistakenly think flower essences are essential oils. Flower essences do not smell like anything except a bit of alcohol. If I take more flower essences, I should get a better result. Calibrating the essences is important. Some people will find too much quantity of a flower essence taken too frequently will cause their self-awareness to be too strong and uncomfortable. Dial down the volume you choose and the number of times you take the essence throughout the day to calm this feeling. You are in control of selecting the amount and frequency that agrees with you. Some people only require a few drops of essence per week. The usual dose is four drops, 4 X per day. Create a sacred time around taking them, so your intent can be amplified by the process. Essences should affect everyone the same way. While it seems to be true that flower essences will similarly affect many people, there is much individual variation. The variation stems from the difference in personal perception, sensitivities and timing. People seem to have affinities to certain plants and some plants seem to be stronger allies for some individuals. Techniques like journaling, meditating, body scanning, mindfulness and dream work can help heighten awareness and insight while embarking on a flower essence adventure. Essences are just for people. Some vets and animal lovers and owners find they get fabulous results with the flower essences. Some users say that animals have less resistance to the idea of taking essences and respond more directly. If you use flower essences with your cats or dogs, try putting a drop of the essence in their water bowl. Some people also have had great results using the essences on plants as well. Try a few drops of five flower when transplanting; it might reduce root shock. Flower essences only work if they are taken internally. Some people prefer to make a spray bottle with essences and water and lightly dust their “aura” with this. Others like flower essences in the bath, or apply to pulse points on the skin. Wolf Willow flower essence from Prairie Deva is a beautiful way to engage your imagination and psyche to help develop boundaries around what is new in your life – call in the wild, protective wolves from the four directions while using the essence and repeat what you would like protected. Have the wolves alert you if your boundary is being crossed. The flower essence Scleranthus of the Healing Herb brand is useful for people who have important decisions to make and cannot decide between two choices. Flower essences such as five flower may be useful to help calm in situations as diverse as feeling overwhelmed while shopping, to getting distressing news.